Astrology is a wonderful tool for deep self-exploration and personal intention-setting. It is also useful in looking with a dispassionate eye at the mundane world of governments and leaders. 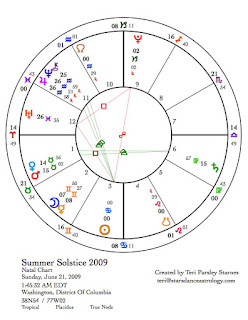 The Summer Solstice chart (the Cancer Ingress Chart) informs us about the mundane issues that are important to our civic lives. Such a chart can answer questions like, How will the economy do this season? How will President Obama lead the country over the next three months? What public sectors ask for more attention at this time? Summer Solstice. The chart for the Summer Solstice set for Washington, DC has an Aries Ascendant. Coincidentally, the Spring Ingress chart for Washington also had Aries rising. The tone is one of taking action, leading the way. The ascendant on a mundane chart set for that country’s capital describes the nation—how the rest of the world perceives us. Along with displaying leadership we may be perceived as aggressive or willing to fight for our point of view. Mars, the chart ruler is in stubborn Taurus, the sign of Mars’ detriment. Our leadership may feel heavy-handed or simply out of touch. However, I am intrigued by the conjunction of Venus in her own sign, Taurus, with this Mars. Mars and Venus have been traveling together for an extended period of time due to the recent retrograde motion of Venus. Venus has been moving much slower, at Mars’ speed. These two have had quite a conference, first in Aries and now in Taurus. The tryst is about to end now that Venus is speeding up again. Perhaps the god of war taught the goddess of love a bit about his direct approach while they were both in Aries and now she instructs Mars in the ways of beauty and delight in her own sign of Taurus. Perhaps the lessons of will and pleasure will help us all to be better leaders in the world. Venus and Taurus also rule the economy. Venus being strong in her own sign and applying to a harmonious trine with Saturn in Virgo, is an indication that there may be more stability in the economy this season. It would be a good thing to take this strong Venus/Saturn connection into action around what we need for sustainability and wholeness. Saturn’s transit through Virgo has called attention to health, holistic living, and stewardship of the Earth. Progress may be made in these areas this summer because the only aspect Saturn is making in this chart is that trine to Venus and Mars. The trine between Venus/Mars and Saturn also describes President Obama this season, since Saturn rules the 10th house, which describes a country’s ruler or leader. The major problem here is that things may move slowly for Obama with Mars being in Taurus, but these planets contribute a feeling of security, stability, and effectiveness. The Moon in these charts describes the people of the nation. The Moon is In Gemini and is conjunct Gemini’s ruler, Mercury, in the second house. It looks like the people are hungry for information, especially information that will help them create sustainability and economic stability – issues that pertain to the 2nd house. The most difficult aspect in the Summer Solstice chart is the opposition between the Sun and Pluto. Pluto unveils toxic secrets and rules the 8th house of debt. The Sun represents conscious identity and rules the 5th house that pertains to, among other things, the stock market. There is a link between the speculation of the 5th house and the debt we are holding. Will those who are responsible for our economic mess be held accountable? Will we find the will to create new laws and regulations that could prevent such abuses? Uranus is the revolutionary force that is squaring Pluto and the Sun. This square from Uranus is a hint of stronger revolution to come when this planet moves into Aries in May 2010. The times are indeed changing. The trio of Jupiter, Neptune and Chiron in Aquarius are perfectly located in the 11th house-the Natural House for Aquarius. Past boundaries of separation are dissolving in our communities and organizations. Jupiter takes this even further; perhaps we are experiencing more unity throughout the world. Although I am not sure where the Internet fits into the mundane house system of astrology, a good case could be made for the World Wide Web fitting into the 11th house. Social networks are a new frontier. However, as a culture, we seem to be more enamored with the latest cell phone technology than we are with the idea of doing the hard work that will help us solve some of our crucial problems. Neptune always presents us with the latest and most enticing illusions. Connection to others is valuable; new toys may distract. 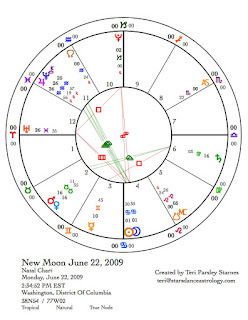 The New Moon this month occurs a day after the ingress of the Sun into Cancer. 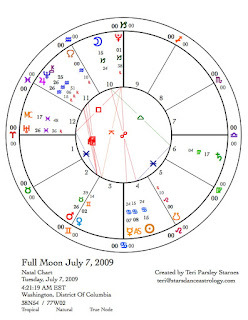 Therefore most of the same qualities for the Solstice chart hold true for the New Moon chart. The Sun and Moon this month face off with Pluto, and both sides of the opposition are forming a square with Uranus. At the beginning of this lunar month it may be hard to grasp the calm energy of Venus/Mars in Taurus trine to Saturn. We may be facing off into our own oppositions, which seem to evoke power plays about who is in control (Pluto provokes these responses.) This New Moon in Cancer is a time to honor our feelings. How we feel about our beloveds, how we feel we are being treated, how we feel about the downtrodden, how we feel about our feelings. If we are feeling a little reactionary, it could be that Pluto and Uranus want to take these natural and normal feelings and place them on a much bigger stage where it may think they mean so much more. This lunar cycle is a time to understand how feelings are important and how they can get blown out of proportion sometimes. The square between Mercury and Saturn in the new moon chart invite us to try and explain, discuss and reach better understandings with others. This will be good work this month. The Full Moon will be a penumbral lunar eclipse—an eclipse so barely an eclipse that it will not be visible to the naked eye, according to NASA’s excellent Eclipse Web Site . Still we may sense a shadow falling over the Full Moon’s brilliance this month. Energetically, eclipses are times when we may be set suddenly upon new paths. This Full Moon occurs in the middle of the opposing signs of Cancer and Capricorn. These two signs are about ways we manage, parent, tend or defend what we cherish. Capricorn means business. What ways do we need to embrace the true seriousness of our global situation? What are ways we need to take responsibility? This Full Moon may illuminate that for us. The triple conjunction of Jupiter, Neptune and Chiron (see here for more about this) are squared by Mars in Taurus. Last month, Mercury was in this position. The message has been sent by Mercury that our boundaries are merging in both wonderful and perhaps alarming ways. Now Mars will invite us to take action. The harmonious trine from Saturn to the Moon and the encouraging sextile to the Sun seem to offer a brief respite from the overly-critical nature of Saturn in Virgo. We can feel that Saturn is actually on our side. Now is a really good time to take stock of all the Virgo things you have taken on since September 2007 when Saturn entered Virgo. Virgo-approved activities are: organizing your life, initiating and maintaining personal practice—especially those practices that improve your health, service actions, and honing one’s knowledge about any topic. In August, Saturn will enter the last decan of Virgo (the last third of the sign). The final push to acquire all these Virgo lessons will really heat up then. Summertime can be a wonderful time to take a break, change our schedules, find ourselves doing work that feeds our bodies or hearts. Soak in the Sun’s blessings this season and have a good summer.